Why does my cat/dog still have fleas even though I have used a flea treatment? It’s quite a common question, but with a little knowledge of the flea life cycle and appropriate treatment at the correct interval, you should be able to eliminate flea’s infestations from your pets. So let’s start with the Flea. There are several species, which although have their own natural host do not mind trying a different one occasionally. Among them are Cat fleas – although often found on dogs, Dog fleas, and even Rat fleas! The female fleas need the blood of a mammal to produce their eggs. The flea life cycle – female adult lays eggs after feeding and defecates discarded blood which drops onto ground/indoor surfaces, eggs hatch into larvae which eats this blood and other matter then pupates before hatching as an adult flea. Vibrations/movement, increases in carbon dioxide levels causes this hatching i.e. availability of hosts. Flea jumps onto host and cycle starts again. The eggs can remain dormant for many years until conditions are favourable to hatch. Why does one of my pets always seem to be bothered by fleas? Flea saliva that is introduced into host during feeding with specialised mouth parts can be very irritant to some animals, some just find flea saliva very itchy and may have a sensitivity to it. 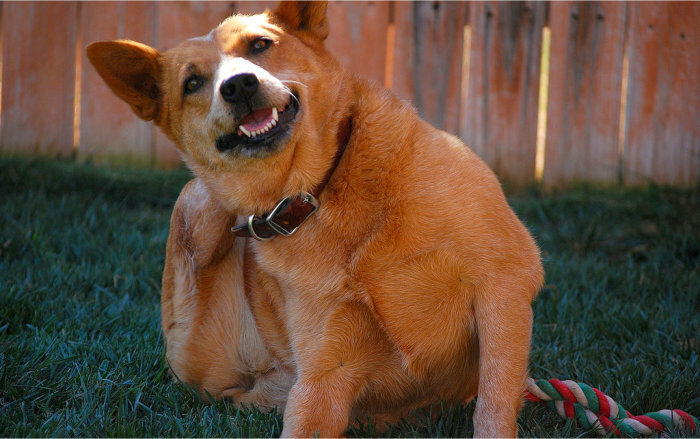 Just because one pet is scratching does not mean the others do not have fleas as well! How do I get rid of fleas? It’s a matter of removing both existing adult fleas, stopping re-infestation, and eliminating sources of favourable infection. It was once estimated that one flea can produce 30,000 eggs that may be viable for up to ten years! 1) Treat the environment – Use a spray that kills adults, larvae, pupae and stops eggs hatching. There are products that last up to 1 year. We always recommend this essential step. Think like a flea – warm dark spaces are where they will be found. Under sofa cushions, under beds and chest of drawers, the back of the family car! 2) Treat the pet with a product that stops at least 2 stages i.e. hatching/growth and adult fleas. 3) Treat on a regular program according to the licence of the product used. For animals which seem allergic to flea saliva that may be once a month. One flea treatment will not last forever! 4) Treat pet in the house, not just the one scratching. Which product to use on your pet? There are many ways to stop flea infestation, prevention is always best. There are spot on products, some of these are more effective than others. Dog products are NOT to be used on cats – some products for dogs are toxic to cats. There are Collars, in food products and pills. What might suit one family may not suit others. For those who do not like applying drops to their pets a once a month , a pill may be best. For those with a busy life, there is now a collar that lasts for 6-8 months for both fleas and ticks. Lastly remember fleas carry tapeworm eggs, so regular worming is also important. If fleas still leave you scratching your head, ask us for some help!